India's unorganized auto-rickshaw sector presents a huge business opportunity to bring about social and environmental benefits. Photo by Kara Newhouse. 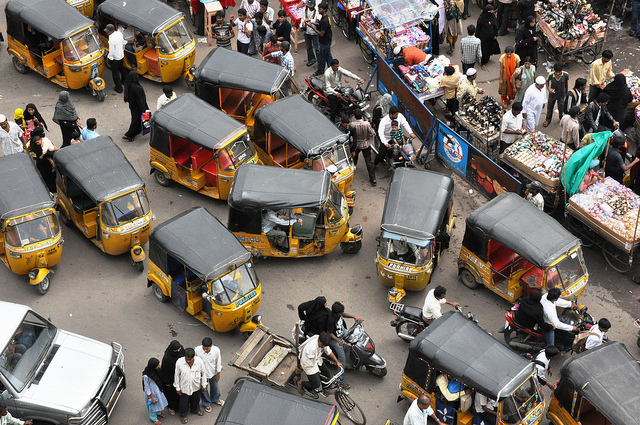 Auto-rickshaw services in Indian cities are predominantly unorganized in nature, wherein services are provided by individual owners and operators competing against each other for the passenger market. This structure, coupled with an improper governance framework, has created significant problems for both drivers and passengers, and it has resulted in negative externalities in the economic, environmental and social realms. These issues and solutions to address them were discussed in a recent article published by Mint, which we highlighted in a previous blog post. Given that the unorganized structure of auto-rickshaw services is a major contributor to the problems afflicting this sector, the opportunity to address these problems lies in the promotion of organized fleet services. Research conducted by Schaller on the taxi industry in the United States highlights the need for a two-tier permit framework, where the existing set of permits for individual taxi owner-operators need to be augmented with a second tier of permits to promote fleet taxi services providing dispatch (i.e. dial) services. EMBARQ India’s research indicates the need to apply Schaller’s recommendations for the Indian auto-rickshaw sector, as well, in terms of promoting fleet-based dial-a-rickshaw (DAR) services. Promotion of these services, as part of a comprehensive policy vision for the auto-rickshaw sector, will be discussed in a forthcoming publication by EMBARQ India. Brand image: Distinct brand image for the sector and improvement in public perception for auto-rickshaw services. Fleet management: Improved management of auto-rickshaw fleet, resulting in better maintained vehicles and economies of scale. Dial-a-rickshaw service: Introduction of technology in fleet and the ability to provide dial-a-rickshaw (DAR) services. Driver benefits: Introduction of employment benefits to drivers, such as insurance, and additional revenues from fleet advertising. The ability to achieve economies of scale from fleet management, as well as the potential to generate additional revenues from dispatch (DAR) services and advertising, indicate that in addition to the above benefits, there is a strong business case for organized fleet DAR services. This can be observed in terms of the implementation of entrepreneur-driven fleet service initiatives in the auto-rickshaw sector in many Indian cities. These initiatives highlight the various business models and technology applications being implemented to provide fleet-based DAR services. Given the size of the auto-rickshaw market in Indian cities, scaling up entrepreneur-driven fleet auto-rickshaw services would be imperative to both ensure their viability and, at the same time, realize the potential of these services to bring about positive transformational change in the auto-rickshaw sector. In addition to the business case, highlighting the “green” (or social and environmental) benefits of fleet DAR services provides the biggest opportunity to attract social investors to promote green entrepreneurship in this sector. Environmental benefits: Fleet-based DAR services can help mitigate environmental impacts of auto-rickshaws through improvements in operational efficiencies (reduction of avoidable emissions from empty trips by linking supply to demand) and fleet maintenance programs. Research conducted by EMBARQ India shows that empty trips in cities can account for up to 25 percent of total daily trips, providing a significant opportunity to address these excess emissions. Fleet-based services also provide the opportunity to transition to improved engine technology (two-stroke to four-stroke), thereby resulting in environmental benefits (reduction in PM emissions) from such a transition. As an alternative to private motor vehicles for occasional trips, such as trips to the airport or emergency trips, fleet DAR services can also enable the implementation of strategies to mitigate private motorization, and thus, contribute to environmental benefits. To auto-rickshaw drivers: Provision of fleet-based DAR services can improve the socio-economic conditions of drivers by providing them with access to employment benefits and additional revenue sources, such as advertising. To passengers: Social equity by way of accessible, affordable and safe transportation choices for elderly, women, disabled and children passengers is a core aspect of promoting sustainable transport services. Fleet DAR services can help meet this goal by providing household access to auto-rickshaws through centralized calling facilities, affordability of service, as well as passenger safety through centralized tracking of vehicles using GPS devices. Linking entrepreneurs implementing fleet DAR services with potential social investors will thus be an important step towards promoting green entrepreneurship in the auto-rickshaw sector. Recognizing the importance of promoting green entrepreneurship in the auto-rickshaw sector in Indian cities, EMBARQ India will be organizing an entrepreneurship summit on February 9-10, 2012. This summit is planned to serve as the platform for discussions between entrepreneurs, investors, experts and regulators/decision makers on the challenges and opportunities in promoting green entrepreneurs (providing fleet DAR services), forging partnerships between investors and entrepreneurs, and creating the enabling regulatory and policy environment to initiate and scale-up such services that can achieve “triple-bottom line” benefits in this important urban transport sector in Indian cities. For further information on the summit, please contact EMBARQ India Transport Specialist Akshay Mani at +91-22-24713565 or amani [at] embarqindia [dot] org.